Hillary Clinton in Laos – Patrick F. Clarkin, Ph.D.
For at least a few days, one of the most emailed article on the New York Times website was a story on Hillary Clinton’s recent visit to Laos, the first there by a U.S. Secretary of State since 1955. As the title of the article suggests (“Vietnam War’s Legacy Is Vivid as Clinton Visits Laos“), much of Clinton’s brief visit pertained to the legacy of the Second Indochina War in Laos. Between 1964 and 1973, the U.S. dropped the equivalent of one planeload of bombs every eight minutes, for 24 hours a day – one ton of bombs for each of the 2 million people in Laos at the time, making it the most heavily bombed country per capita in history. These bombings were part of a campaign – kept secret from the American people, not formally authorized by Congress, and in violation of international accords – whose purpose was to deter communist proliferation. But the people who suffered most were ordinary Lao villagers. What is particularly significant from the LNRA report is that 40% of recorded casualties actually occurred after 1973, the year that bombing ceased. 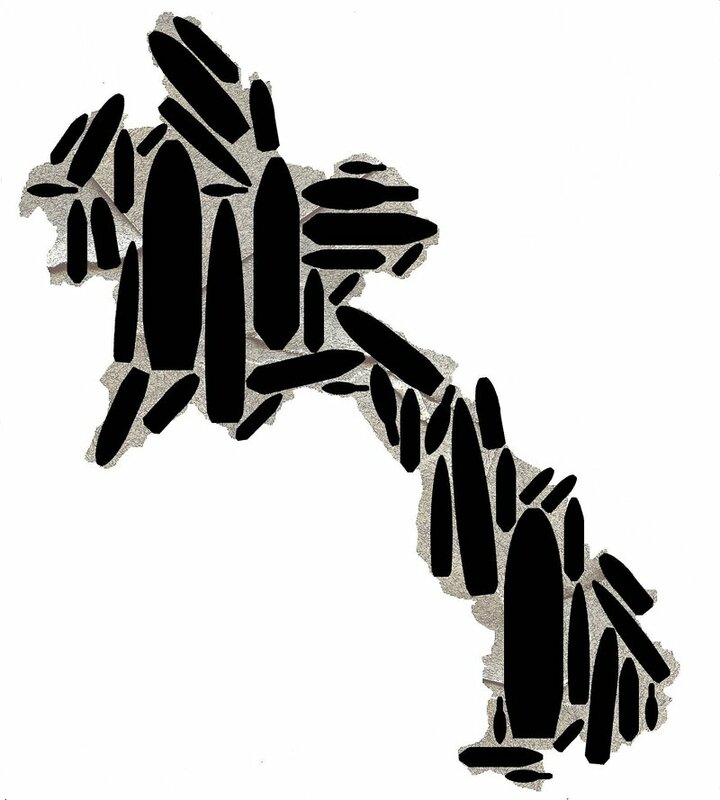 The nature of the bombing campaign, in particular the widespread use of cluster bombs, meant that it was inevitable that massive amounts of ordnance would remain in Laos for decades. Khamvongsa and Russell (2009) note that between 1996- 2006, removal teams had cleared approximately 144 km2 of land, or just 1% of high-risk areas and only .04% of total contaminated land. In a 2009 AlertNet article by Thin Lei Win, (Mike) Boddington stated that “after 15 years of official clearance operations, we have managed to clear about 400,000 (of an estimated 80 million cluster bombs still in Laos). If you do the sums, you’ll find that in order to clear all of the bombs in this country, it will take 3,000 years.” Think about that. Meanwhile, the number of UXO casualties remains around 250 people per year into the present, 37 years after the bombing campaign officially ended. At a minimum, Channapha Khamvongsa, who works tirelessly for the organization Legacies of War, wrote that one of the the tangible benefits of Clinton’s visit was that the press could “now spell ‪Laos and point to it on a map.” (She also had a very well-written piece on CNN). Laos has been invisible to many in the press (and to most Americans) for a long time, despite the fact that the country has been affected for decades by U.S. actions there. Clinton’s visit could at least put the legacy of the war in Laos in the consciousness of the press, if not the wider American public. Hopefully, there will be more concrete steps in that direction. One report from the Inter Press Service said that Clinton was seriously considering increasing funds for UXO clearance, though I haven’t seen anything confirming that. I know that there are dissenting opinions out there, and many people subscribe to the belief that there are more pressing matters for U.S. interests than a small country like Laos, that the war is part of a distant past, and that the bombs the U.S. dropped there fall under the notion of “all is fair in love and war.” Still others feel that the U.S. should never waver (or apologize), since that shows weakness. However, there is also the idea of the Pottery Barn Rule, attributed (perhaps apocryphally) to another Secretary of State, Colin Powell, in reference to Iraq. Though Powell may not have used that exact language, he did say that “once you break it, you are going to own it.” If Laos is broken, then the U.S. has an obligation toward helping to clean it up. This entry was posted in Laos, UXO, War and health and tagged Hillary Clinton. Bookmark the permalink. Patrick. Thanks for bringing this to the attention of those like me who do not read the New York Times. I am pleasantly surprised that the visit was given such high profile treatment in the USA. The NYT article contrasts with the media coverage in Laos itself. On Lao TV news of that day there was no mention and in the press the next day there was a small mention, with a 2″ square box of the front page, half of which was a picture of ‘Hilary Rodham’ — a totally unknown quantity here. The NYT article mentions that Laos is controlled by a ‘Communist Party’. That statement is understandable but wrong. The only party allowed by the Constitution is the Lao People’s Democratic Party. The word ‘Communist’ is not used and never has been used in any official Lao documentation referring to Laos. Mention is made of Ambassador Douglas Hartwick. I had the pleasure of knowing him throughout his tour in Laos early this century (alphabetic seating order placed representatives of Thailand, United States and UK next to each other –a happy coincidence) and on many occasions I shared with him my own views, which would see America not only apologising but fully compensating victims and clearing contaminated areas which together are the size of Florida State. I was amazed that his views were remarkably close to mine. If Hartwick were running for President, the US would have a real choice, but that’s just my opinion as a non-American. Hartwick was also most instrumental in securing normalization of trade relations between the US and Laos and supporting Laos’ membership of WTO (yet to be realised). He had great sympathy with Laos, took the trouble to try to learn the language and in a great many ways provided a face of America that was far better than America deserved. He had a difficult job. He is of course obliged to state the US official version of bomb tonnage — which is much less than that of other agencies and countries, but whether it was 1 ton per person or 2.5 tons doesn’t really matter, does it? While Hilary’s very short visit was historic a the first State Visit in 57 years, Henry Kessinger (I have spelt that wrongly) was here in 1972 unofficially to discuss ceasefire terms for the war that wasn’t. The visit to COPE (which provides limbs to bomb victims) with no commitment to increase the tiny US finance was seen as highly hypocritical. Perhaps this has something to do with the election year, but after Obama can relax, let the US put it’s money where Hilary stood (very briefly). Until France gave some money at the UXO Convention meeting here last year, COPE’ visitor centre was supported by charity (40% from my publishing house in Laos). Laos has never insisted, or even requested, an apology from the US. It is more interested in clearing the remaining UXO. There is disappointment that the US still refuses to sign the Convention banning cluster bombs — of which the UK (#1 ally) and Laos were the first signatories. But Vietnam and Cambodia have also not signed — and neither has China (which never signs anything) nor Russia nor Israel. While every little bit helps, it must also be stressed that the US is a minor donor in the effort to clear UXO. Currently in terms of cash, equipment and ‘boots on the ground’ the leaders are Japan and Norway — two countries which certainly have no responsibility for the problem. Does this not shame Americans? The article was wrong on the number of victims currently. There are no longer 250/year. Great efforts to inform farmers and schools of dangerous areas have reduced this number to under 100/year. Those injured are, if they can get to a centre, given limbs and the blind are given a white stick but there is practically no follow up in terms of providing alternative means of livelihood — the money isn’t there. Robert, thank you for your first-hand insights. The description of Hartwick is encouraging. He sounds like an honorable person, and hope his current successor is like him. However, I don’t see him running for the presidency. On the other hand, there are rumors that Hillary Clinton might replace Biden as Vice President should Obama be re-elected. I don’t know how/if that might affect policy toward Laos. As you say, perhaps after the election things will change. Perhaps things like Clinton’s visit and the prominence of the NY Times article, which was surprising to me too, might increase Laos’ visibility. We’ll see. You pointed out a number of errors above – Laos is not communist, the tonnage of bombs per person, the number of deaths per year. You’re right, of course, that facts do matter. One of those mistakes is mine – the 250 deaths per year. I believe I got that figure from a graph in the 2010 LNRA report. Unfortunately, that hyperlink is broken. I stand corrected, and think it is a good thing that the deaths are not as high as I cited (though still too high nonetheless). It’s enough to make an optimist into a cynic. Patrick. Tending towards optimism is a good thing for a young person, an unrealistic thing for an old man who has seen the violence and the generosity drawn out by any war, who knows the balance is far from equal, and who is quite aware that Man fashioned the iron sword before not after he made the shield. I am however driven to optimism to hear that Hilary might take over as Deputy President. That will mean she will disappear from public view, at least on the international stage. I read the article you referenced and happily dismiss it and the two comments. If this is the best the American right wing can come up with, Pres Obama is home and dry — and I think that a good thing, both as a Brit and as an honorary Lao. Regarding an apology (the subject of another of your interesting blogs), I don’t see that it matters in Laos, although it would be good for Americans. The first action of the new regime in 1975 was to put on trial the war criminals — all of whom were Lao citizens. They were sentenced to death in absentia, but not executed in absentia (that sounds impossible until one remembers Trotsky). No apology will be requested for the same reason the blind boy with no hands who met Hilary will not claim for compensation from America. He could only claim against the specific pilot who dropped that specific bomb sometime between 1964 and April 1973 and against the US bomb maker. This is because every single bombing order was signed off by the Royal Lao Government, and every pilot was either a regular or freelance employed by the Royal Lao Army or a regular soldier-pilot with the Thai armed forces (of which 7,000 were lent to Vang Pao). Even with hands and sight, that would be impossible. I do not want to detour the piece you presented, which is important, but I can tell you Hilary’s visit here was ignored apart from the necessities of civility. Laos is far more interested in ASEAN and the ASEM (Asia and Europe Meeting) that will take place here in November. And of course with the constant business with China. But most ministries do now have TV and when it is working they watch BBC and CNN and will welcome a second-term for Obama. Perhaps I shouldn’t say that, it would not help him domestically. America could learn a lot from Laos, perhaps the only country in the world to get on well with all its neighbours and its former enemies. Where anybody can walk any street in the capital city at any time without fear. UXO is an unwanted problem with economic as much as social consequences, but the number of killed and maimed in Laos by UXO is far less that those deliberately violated by their fellow Americans in the USA.